Joel Z. Green, the lawyer for opponents of a proposed 95-unit apartment building on lower Bronson Road, wraps up his presentation to the Town Plan and Zoning Commission Wednesday night in McKinley School. 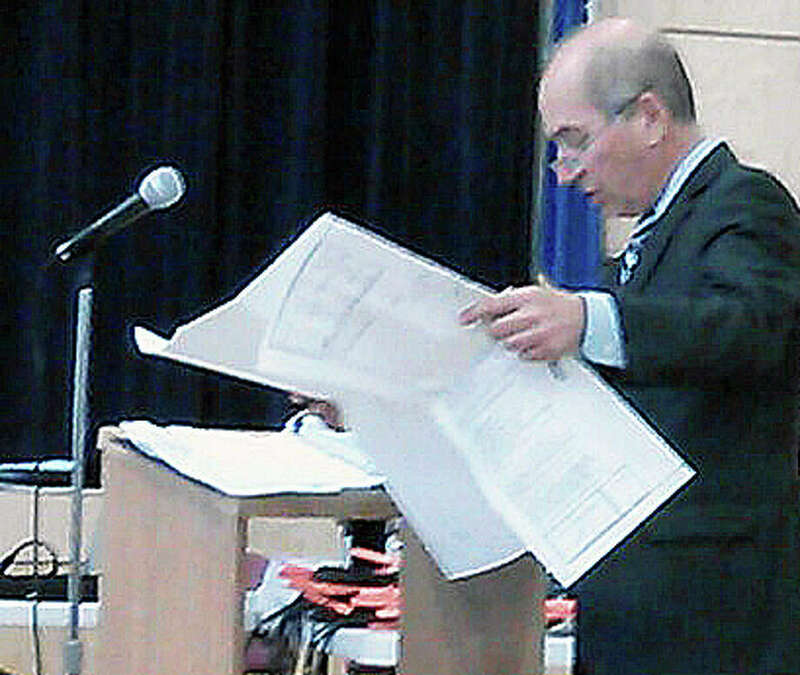 John Fallon, the lawyer for a developer who wants to build a 95-unit apartment building on lower Bronson Road, had a rough start to his rebuttal at the fourth and final public hearing on the controversial project Wednesday night. The controversial application by Garden Homes Management was the topic of 16 hours of testimony and debate in the past nine days when the Town Plan and Zoning Commission ended its hearings on the plan about 11 p.m. Wednesday. The Stamford developer's plan calls for construction of a three-story apartment building on 2.7 acres at 92 and 140 Bronson Road. The property, which the developer has a contract to buy, is bordered by an Interstate 95 on-ramp and Metro-North Railroad tracks. Fallon opened his rebuttal Wednesday by suggesting "conditions of approval" that the TPZ could adopt when it expects to vote on the development application next week. But Fallon only made it halfway through his list before Matthew Wagner, the TPZ's chairman, said it sounded like he was changing the development plan without allowing it to be reviewed by Joel Z. Green, the lawyer for opponents, or the public. Neighbors of the proposed development have expressed strong opposition to the plan at the earlier meetings on the application. "You're proposing a new plan with new parking, a turnaround and smaller number of units," Wagner told Fallon. Fallon disagreed: "We offer not a revised plan but a sketch as to how these can be implemented." Wagner said none of Fallon's proposed conditions of approval had been reviewed by engineers or the public, and questioned whether Fallon was "conceding there are public health, safety and welfare issues that are problematic for which you have to make modifications to your plans." Fallon said he stood by the application that was filed by Garden Homes and that his proposed conditions of approval were in "no way any admission there are public health and safety issues." He said the commission had an obligation to find conditions of approval, instead of denying the application if they exist, because the development application was filed under 8-30g, the state's affordable housing statute. Fallon said he was trying to be constructive. Wagner brought Green into the argument by saying he wanted Green to submit something in writing that spoke to what Fallon was proposing. Green said he and his clients "strenuously object" to Fallon's conditions of approval being part of the record "without our having the opportunity to review them." Fallon suggested Wagner consult with Town Attorney Stanton Lesser. "You can be sure I will," Wagner said. "You sat there for 2½ hours with that in your bag; didn't give it to me, staff or opposing counsel." - Increasing the number of handicapped-accessible parking spaces from two to five. - Creating a turnaround on the proposed 20-foot-wide driveway into the site so a Fire Department ladder truck wouldn't have to back out of the driveway to leave the site. - Stating the project could go forward only if the Water Pollution Control Authority allowed the apartment complex to link with sewer lines. - Enabling the owner of 76 Bronson Road to eliminate a driveway apron serving that property and leaving the paved area intact. All of those changes would result in five fewer parking spaces and eight fewer units, according to a sheet Fallon gave to the commission's staff. But that sheet, which had white-out underneath inked-in numbers, didn't seem to make it into the record. Fallon said, "We'll leave it we orally suggest conditions of approval for your consideration." Later, Fallon called witnesses to rebut testimony Tuesday night by Fire Chief Richard Felner and former Fire Marshal Harry Ackley that the 20-foot-wide driveway would be unsafe, as well as the testimony by David Spear, the opponent's traffic consultant, that the development didn't have enough parking spaces and created a "very undesirable traffic pattern" because the driveway would be next to an I-95 on-ramp on Bronson Road. Kermit Hua, Garden Homes Management's traffic consultant, said all the intersections near the site are measured at acceptable "levels of service" and would continue to operate at those same levels if the apartment building were built. He said Spear's contention that motorists leaving the apartments' driveway at a slow speed would conflict with motorists on Bronson Road accelerating to the on-ramp is "not supported by evidence in the traffic report." Hua said the apartment building wouldn't be a "major traffic generator" because it had fewer than 100 units. "The net increase in traffic is very limited," Hua said. "This is not a busy road. There is enough capacity for additional traffic on Bronson Road." Hua also contended that 1.2 parking spaces per apartment unit would be adequate, and Fallon added that standard was used in a recently approved apartment building on Fairchild Avenue. But Green had noted before Fallon's rebuttal that the Bronson Road site is not near a public parking lot that would be available to accommodate overflow parking. "Any estimate done should be done for maximums, not minimums, since there is no overflow capacity available," said Donna Wiesman of Rockview Road, one of a dozen people in the audience who spoke against the project Wednesday night. Regarding Felner's comment Tuesday night that it would be difficult to fight a fire in parts of the proposed building because of its proximity to Metro-North Railroad tracks and catenary wires, Andrew Hennessy, the developer's architect, said the building would have a sprinkler system and a central fire alarm system that would alert tenants to a fire by sound and lights. Wood used in the building's construction would be "fire rated" to resist the passage of fire for an hour and "not exposed to a fire condition," Hennessy said. Each apartment's four sides, floors, ceilings and doors, along with the corridors outside the apartments, would be designed to resist the passage of fire for an hour, he added. Lastly, Hennessy said each of the stairwells would have a hose connection for firefighters. "We don't anticipate a fire being fought from the outside. Water is available on every floor," he said. Gerald Alessi, the TPZ vice chairman, said to Hennessy, "Ever been a fireman? Do you consider yourself a better authority on fire safety than our chief of 15 years?" Hennessy replied, "I would not make that statement not knowing his background." Joseph Versteeg, a fire safety consultant for Garden Homes Management, said the driveway's 20-foot width would be sufficient for two-way traffic and for one fire truck to pass another. He said the 20-foot width is accepted in the Connecticut's fire prevention code, though Seth Baratz, a TPZ member, said "not less than 20 feet" is "the absolute minimum mandated." Tuesday night, Felner and Ackley said the driveway would be narrower than 20 feet if it were used for overflow parking or after a snowstorm and that a ladder truck with stabilizer jacks out on either side would take up nearly the entire driveway width. Versteeg conceded that a driveway longer than 150 feet on a dead-end would require a turnaround and estimated the proposed dead-end driveway on Bronson Road as 200 feet long. Green, who was allowed to question Versteeg because he was a new witness, asked, "You don't know if there are adequate turnarounds on the site?" Versteeg replied, "I didn't make that determination." In response to other questions from Green, Versteeg said he first reviewed the site plan Wednesday morning, didn't know what kind of equipment and apparatus Fairfield firefighters use, and didn't evaluate the site plan's closeness to Metro-North Railroad tracks as it pertained to firefighting. Fallon ended his rebuttal by saying 2.6 percent of Fairfield's housing stock is deemed "affordable" by the state's criteria, which he said is last among 22 Connecticut municipalities that receive block grant funds from the federal Department of Housing and Urban Development. Green, during his presentation Wednesday night, said the town's Affordable Housing Commission had declined to take a position on the proposed Bronson Road development. He said Fairfield officials plan to address the town's lack of affordable housing, "but this is not the development that addresses those needs by any reasonable standard." If the TPZ denies the application next week, it needs evidence that the development would pose a public health or safety issue that outweighs the need for affordable housing and that could not be addressed through conditions of approval, Fallon said.